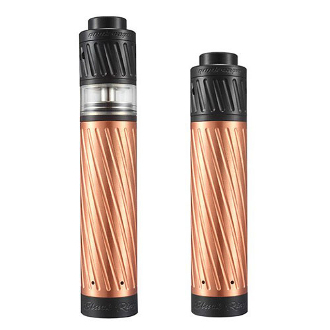 The Karma kit is a premium copper mechanical mod that is paired with a multi functioning atomizer. The mechanical mod has many safety features including its innovative reversible battery placement. Regardless of which side of the battery goes in first the Mech Mod will always work. The mod also has an insulated battery compartment to prevent overheating and shortages. The Atomizer featured in this kit can switch between RDTA and RDA for adaptation to the user's personal style. It's designed with a wide bore insulated drip tip to protect the user's mouth from heat. There is also an adjustable air flow system for an even more customized experience. Paired together the Karma Kit makes for an overall sleek look and owns the title of “The Ultimate Mechanical Mod kit”.